Venda de Esqui Primavera neste Epic Ski In e Out no Peak 8! Great esqui de abril !! 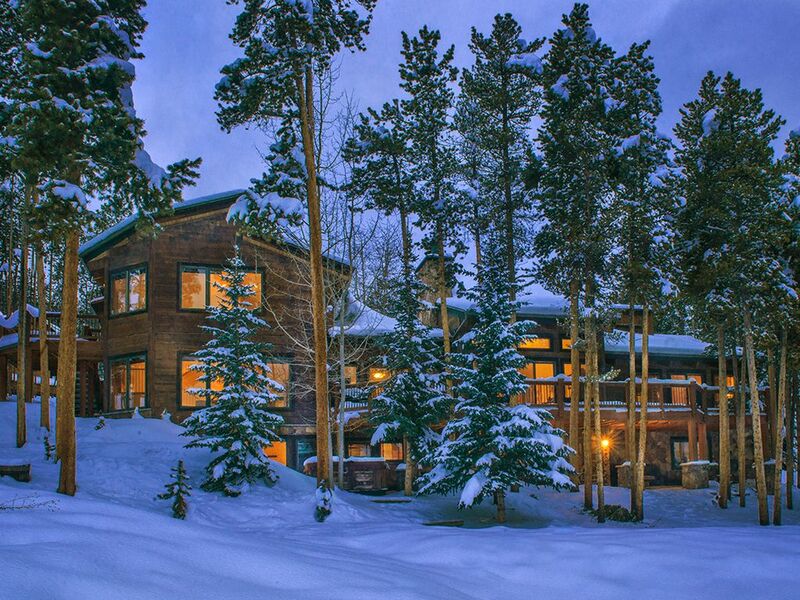 Uma das mais populares casas de aluguel em The Breckenridge Ski Resort! SKI IN, PISTAS no Peak 8! A hora de Verão Caminhada e bicicleta para fora da porta! Esta casa privada clássico é preenchido com caracteres! Você vai capturar salpicos de Oregon e Pensilvânia Arquitetura aqui! 'The Slopeside Lodge' continua a acolher famílias, grupos grandes e pequenos, retiros corporativos, convidados do casamento, e reuniões ... 'Slopeside 'é uma das nossas casas mais populares e reservas rapidamente ..... Inverno e verão! Localizado no Four O'Clock Ski Run e porta de entrada para o Timber Trail Bairro, estamos SKI-IN e OUT! Com a abundância de espaço; você pode se sentar na frente de um dos três lareiras, assistir filmes (10 televisores), Cook uma refeição gloriosa; (Área de jantar para 20), disparar um jogo de bilhar ou jogar jogos na sala da família, dê uma banheira de água quente sob as estrelas ou simplesmente relaxar e apreciar a vista deslumbrante sobre Baldy Mountain. Você está na área de esqui e um pouco mais de 1 milha do centro de Breckenridge! As ofertas de verão caminhadas à direita da porta; vistas excepcionais, e uma rua tranquila! Manchado em Slopeside: urso, alces, raposas, veados, alces, guaxinim, olhando pássaros legal ... mesmo um porco-espinho. Se você precisar de mais espaço; JanesLodges oferece mais casas na área! Desconto quando você reservar várias casas para o mesmo período de tempo! 3 níveis de grande espaço bem concebido, 3 lareiras, Telefones, 10 TVs a cabo, Internet WiFi, videocassetes e DVD players, aparelhos de som com CD player, Outdoor Hot Tub, lava-louças, totalmente equipados de cozinha, lavadoras, secadoras, confortável flanela Lençóis (inverno ), confortável para baixo da cama e abundância de toalhas e banheira de hidromassagem toalhas, grill propano, Bilhar, jogos, bar, 2 salas, 2 salas de jantar, ski-in / ski-out, sala de esqui, vistas de Baldy Mountain, 3 Decks , 2 pátios, trenó ao lado da casa. We had a very large group staying at this property (19) and there was plenty of room and accommodations for everyone. Jane answered any and all inquiries and was always very professional and responsive whenever we had a question or need (and she even had soup waiting for us upon our arrival). Our children and their families said this was “the best family trip ever” and we created many special memories while staying at this clean, large and warm ski-in and ski-out house. Thank you Jane and your team for making this a truly delightful and memorable stay for all of us. The home was exactly as described and was perfect for our group of 14. During the week of our stay, Breck received over 60 inches of snow. The response from the management team was amazing. They kept the driveway clean coming number times each day. Whenever there was an issue or question, Jane responded immediately. We will definitely stay here again. Lots of space and very well kept and convenient. First, the owner was very responsive to questions several months prior to arrival. Upon arrival we were greeted with hot pot of potato soup and bread. Quite the surprise especially after a long day of travel with several young children. A touch of class. The house is very Colorado. Warm and rustic. Plenty of room. This is truly a ski in ski out home. But even better is having a sledding hill out the back door. I sat in dining area and watched our 6 grandchildren sled for hours each day. Probably did more sledding than skiing. We had a crowd of 8 adults and 6 children with plenty of room to spare. The description does not do this home justice. WOW!! Fantastic house with everything you could possibly want. Three generation family trip. Arrived to a warm, great smelling pot of chicken/ curry soup, and a loaf of bread. Wonderful welcome and after a day of traveling, much needed and appreciated. Family of 9. Everyone had their own room and space. 2 bedrooms on main floor with Jack n Jill bath, great for our son and daughter in law and other bedroom for 2 kids, we were up stairs in the MASTER SUITE. Wonderful area, and our three adult kids each in bedrooms in lower area. Warm, comfortable, family area with wood burning fireplace was used everyday. Large round table off kitchen and huge dining area also. Our group cooks and we wanted or needed nothing. Kitchen very well appointed. Large counter so buffet style was great for the group. Jane’s group grocery shopped for us and everything was waiting for us. Wildlife in abundance....Fox, deer, moose (mama and baby) right outside. Moose just across the street, others right in the yard. Great deck. Fairy forest right across the street and an incredible path to the sawmill trail that led down to Breckenridge. Walked along a beautiful stream through the pines. Verrrry convient to Breckenridge. Hot tub is great for large groups. Did family vacation on Captiva Island Two years ago and was told I hit a home run with that place, the family told me I hit a grand slam with this place. In Breckenridge check out the crepe place, Empire burger GREAT. SUNRISE WAS BEAUTIFUL sitting on the deck. Easy access to other hikes, sites etc. Suggestions for renters: Jane sends out a TON of information, read it. Great info. Also, print directions to house, google has a little trouble with the address. If you are not a mountain person, read about dealing with altitude. WATER, WATER, WATER and ibuprofen. If shopping at City Market, bring bags...they charge you for bags. When going back to Breckenridge, with a large group, will not stay anywhere else. STRONGLY, STRONGLY RECOMMEND.